Despite a plan to finish off all my armed civilians this month and work on Canadians NEXT month I spent the weekend working on a 7th Reconnaissance Regiment Humber and a handful of Canadian Infantrymen to finish out a full platoon. This batch finishes off a full strength/war establishement Rifle Platoon. The platoon is a mix of Warlord Games/Bolt Action Miniatures, West Wind Productions, First Corps, Artizan Designs, and Crusader Miniatures. I seem to recall reading… somewhere… That in North west Europe it was rare for a section (of, in theory, ten) to field more than FIVE riflemen!? …aaaaaand here’s the final product. 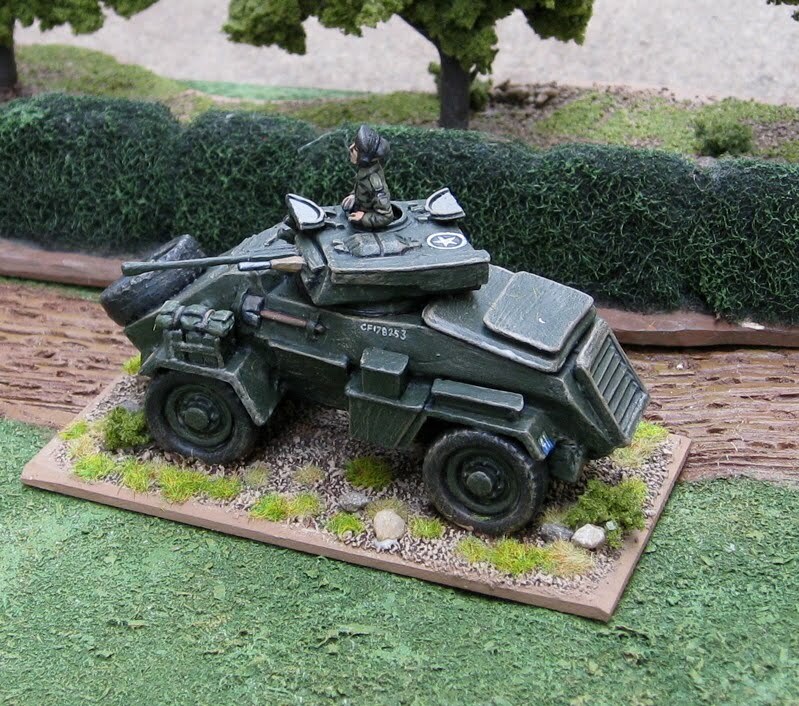 The completed Black Tree Design Humber armoured car. Glued texture stuff to base. Painted it brown. Highlight with lighter brown. Even lighter highlight with tan. Glue on some bits of static grass, pebbles, and clump foliage for shrubberies! For those that haven't been following along this is a car from the 7th Reconnaissance Regiment (17th Duke of York’s Royal Canadian Hussars). 7th Recce was the reconnaissance regiment for the 3rd Canadian Infantry Division which landed on D-Day at Juno Beach. The 28mm WW2 Canadian infantry I am working on are from the Regina Rifles (7th Brigade, 3rd Division), and other elements are also part of the 3rd Division, or units that were attached or supporting the 3rd Division. Not sure what I'm going to use this for... What kind of scenarios would one do for a reconnaissance troop? 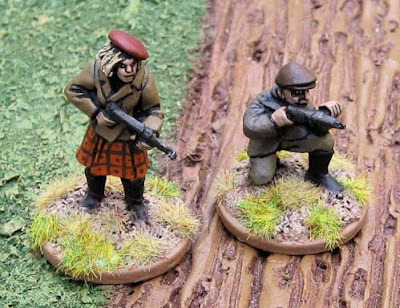 "Okay, here's a table full of terrain... find the hidden germans and report back, and, preferably, don't die..."? Wow… Hope I can power through the Shermans so quickly!! I’ll probably do them as a bit of a batch-lot. Should I do them as a step-by-step to...? Seems there’ll be a few Canadian infantrymen rolling off the workbench before the armed civilians… but they’re coming soon too. I’m using Deco Art Americana “Plantation Pine” - close enough for me…! I know. It looks a little dark, but trust me it won’t look half bad when I’m done – and it’s quick!! 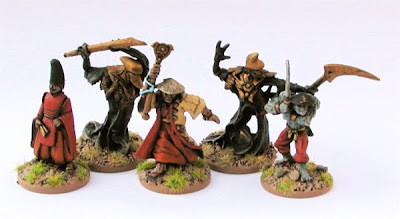 Do keep in mind I’m not painting to win any competitions – I paint for the tabletop! I’d rather models be on the tabletop than on my workbench, so my approach might be seen as quick and nasty. 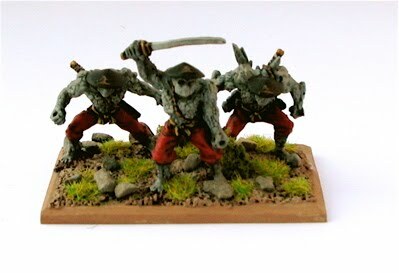 That being said I do try to do a decent enough job that they look good on the tabletop! Step Three – non-main-colour details. 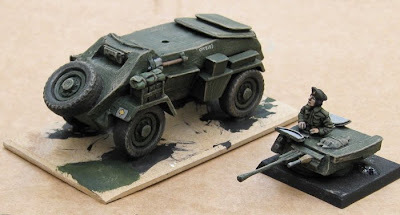 Now I paint all the bits, which I’ve just blacked out, with the colours I actually want them to be… including any vehicle recognition markings. 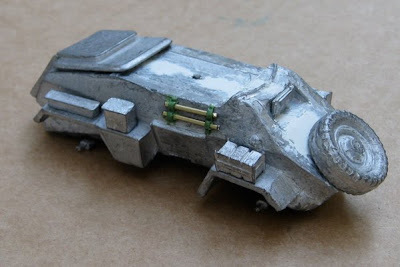 Still looks a little dark-ish and plane Jane-ish… but just wait – once the weathering is done it won’t look so bad. That’s it for today. Later I’ll get a coat of finish on this and then get to work on the base. Thought I’d take a quick pic of the final assembly in the fading hours of light as it will probably be coated with primer by dawn! Still haven’t filed down that barrel… had some troubles with the wheels. Nothing a little drilling and pinning couldn’t fix. I didn’t add any more stowage. Call me lazy… ah, well… I gotta get some stuff DONE!! I have stuck it to a base already. I like basing vehicles. It gives them some added protection in storage. 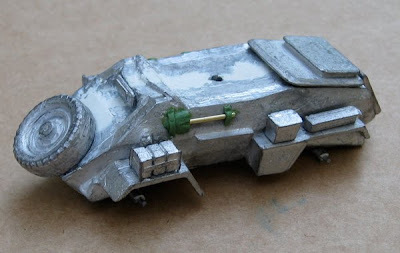 On a model like this – that is very heavy and those wheels are attached with the slightest bit of soft metal - I think gives it a bit more stability. Also it gives me something to hold onto while painting…. This last week or so I’ve been doing some organizing and “tidying” and taking stock and got refocused on things (relatively) modern. 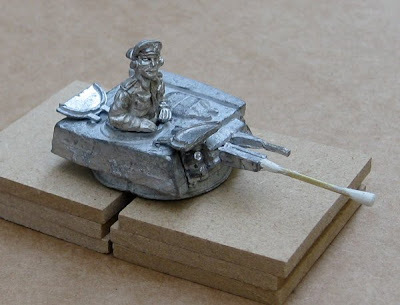 My plan, for the balance of 2010, is to complete the 28mm WW2 era stuff that I currently have. Taking stock I’ve found that I have 1233 World War Two era figures (in 28mm). Of those 781 are painted, and 452 are not-so-painted. Looking over at the totals on the left there it seems I’ve currently painted 604 28mm foot so far this year and purchased 1041… So if I manage to paint ALL of them by the end of the year I will succeed in my goal to paint more figures than I’ve purchased. 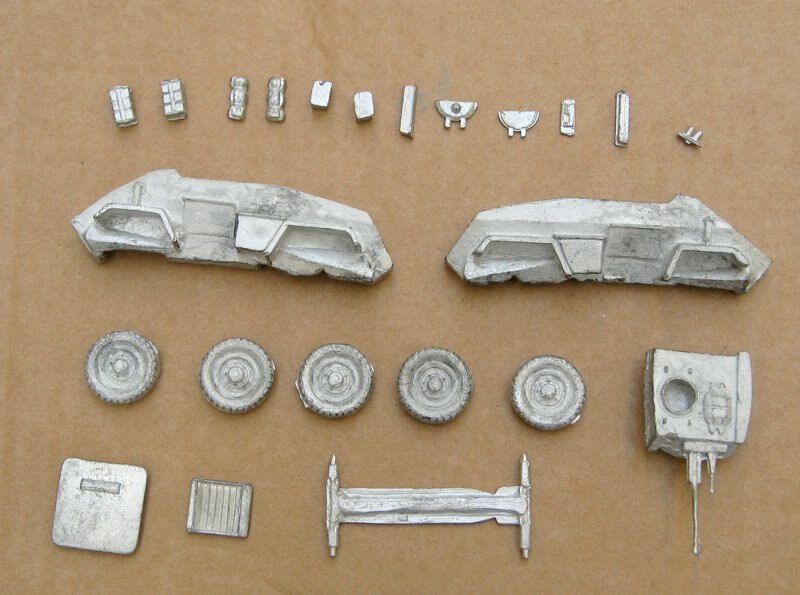 Well… at least more of the 28mm foot… mounted, vehicles and big baddies – I’ll have to get caught up on next year. Of course then there’s tanks and vehicles… I’ll try and get those done as well, but the main focus in the infantry. ** six of these are pre-painted plastic models that are pretty good… I may repaint them sometime, but for now they are passable and useable. I may not get it all done… but it’s good to have something to shoot for! 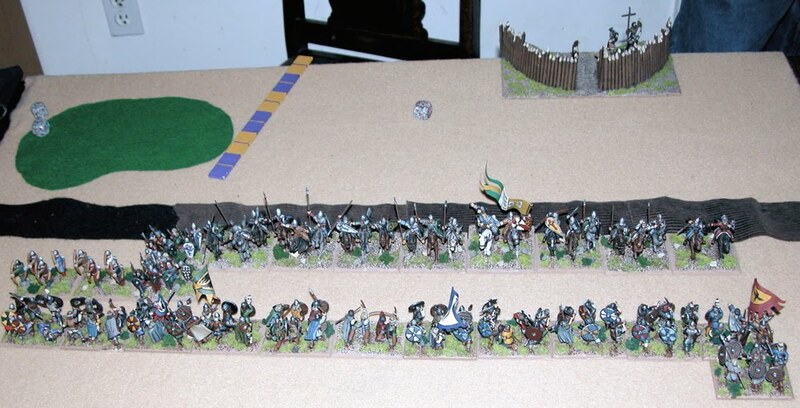 **Armies that I have a complete army that can be fielded but need some extra options or that I have a second complete army/command to paint! I’ve decided that (after this weekend) I am not going to buy any more toys until at least 2012. Oh, there’s a few other things I can think of that I might like (1940 French, SAS mounted Jeep patrol, Italian tanks, more early war Russian and German tanks, etc…) but, seriously… I’ve got to get some stuff DONE before I can be buying any more stuff!!! These were part of Infantry Division Armoured Car Regiments, and as the infantry I am painting up are Regina Rifles (from the Third Canadian Infantry Division)… that would mean my little Humber is going to be from the 7th Reconnaissance Regiment (17th Duke of York’s Royal Canadian Hussars) (Now the Royal Canadian Hussars (Montreal)). B squadron apparently landed on D-Day as traffic control, beach exit parties brigade contact detachements. I had to do a fair bit of filling with Miliput between the two main body parts – though a lot of the joint was covered by the slab-like thingies on the back. On the right side there were two bar-like things opposite the shovel. I’m not really sure what they are… but they’re there in most pictures… so I added a couple on. I'm also going to have to drill out that hole for the turret (it's just not big enough...). 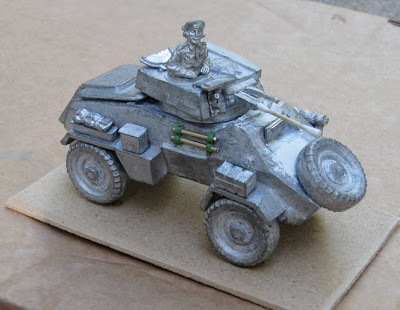 The turret commander didn’t come with the kit – I got him in an ebay lot of assorted vehicles commanders and drivers. NEXT: Wheels, and maybe some stowed kit (if I don’t get too lazy). Then on to priming and basing and painting!! With the German big cats that arrived yesterday my replacement tracks arrived for the Shermans - so I'm awfully tempted to get to work on those... I think I'll finish up this Humber first. Then maybe the SHermans. Though, it would probably be more sensible to work on the German tanks first... but then when has sensibility ever dictated what I should work on next!? 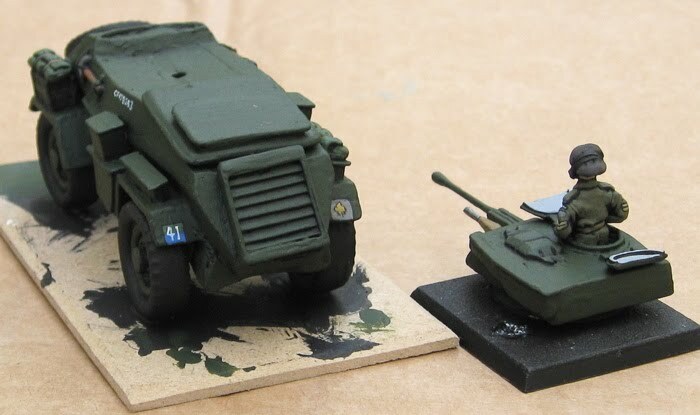 So, I picked up a Harlequin/Black Tree Design Staghound off ebay. I knew I had seen it listed… somewhere… as part of the arsenel of items the Canadian Army used in World War Two… it was a good deal… so I bid, and won it. It arrived last week some time. I do like that it comes with some stowage. I also have a couple commonwealth turret crew from another ebay purchase which I will be adding. Maybe I’ll do a bit of a step-by-step assembly and painting series of posts…? 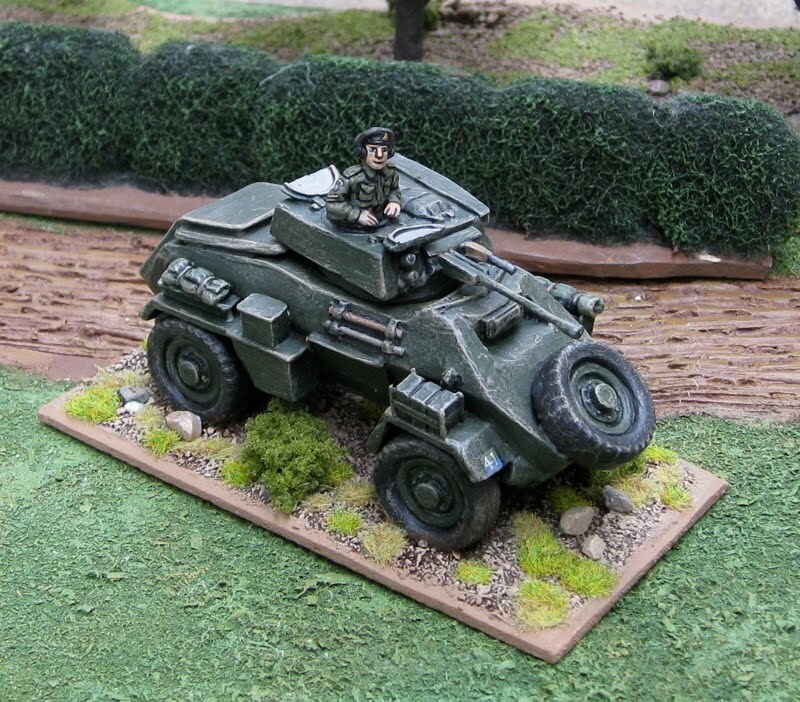 Anyway, looking up the Staghound I found that it was used in Army Corps armoured car regiments. That would be the 1st Armoured Car Regiment (Royal Canadian Dragoons), for the 1st Canadian Army Corps, or the 18th Armoured Car Regiment (12th Manitoba Dragoons) for the 2nd Canadian Army Corps. 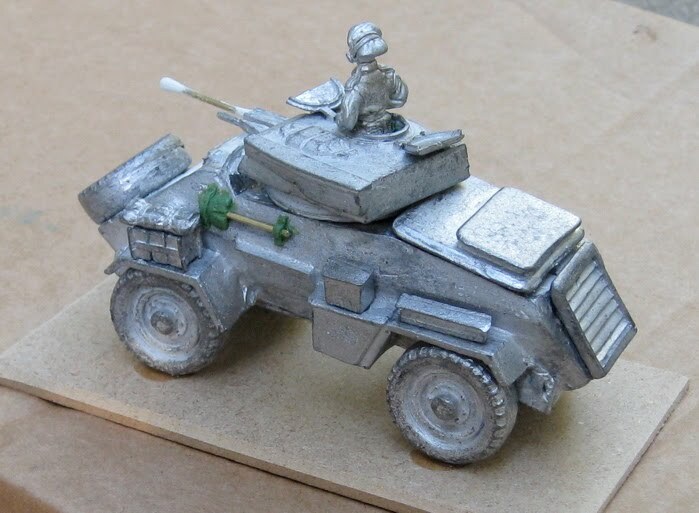 As all my other stuff is being modeled as elements of the 2nd Canadian Army Corps, I guess that will make this a Staghound from the 12th Manitoba Dragoons (18th Armoured Car Regiment). Now my first big question is: What the heck did a CORPS level armoured car reconnaissance unit do!? I take they weren’t out on the sharp end trying to determine the location of the enemy…? I figure that would be the Armoured and Infantry Division’s reconnaissance unit’s job… Were they just for scouting out new locations for the Corps HQs? Providing a little defense and security for the Corps HQ? Seriously, anybody out there have any ideas…? The first items I’m finishing up are the Armed Civilians and a handful of Canadians to finish up the first platoon. Watch for those in the next couple days. 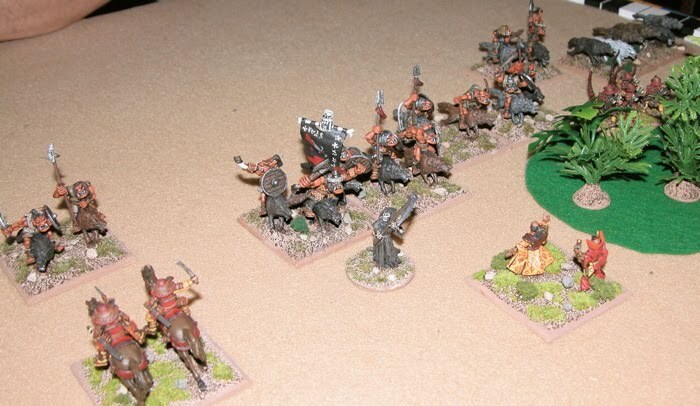 The last batch (I think) of the old Harlequin (now Black Tree Design) Soviets. Taking a break from the Savage Worlds East Front Campaign, I decided to play some Hordes of the Things this evening (in no small part because I finished up the last stands I needed for my Phoenix Clan Army. Because the games are quick we also got in a game of DBA! 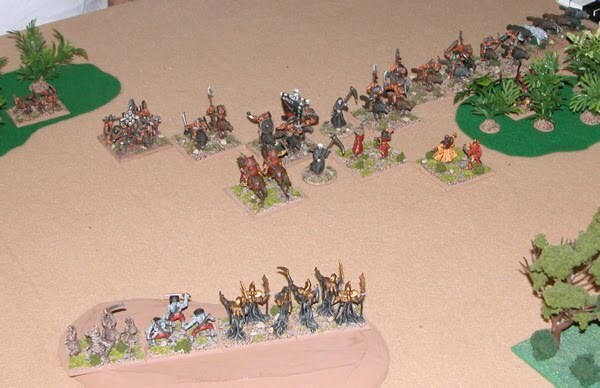 The Orc invaders arrayed for battle! The Phoenix Clan prepares to defend their homeland! The Phoenix Clan sports the “Triple-Wizard Combo”. May seem like a gamey-cheesy- one-trick-pony… but it makes sense for me for the Phoenix Clan – they are pacifist mages… Shugenja are at the fore and if they can enscorcel and enemy and disperse his troops without spilling any blood… well… that seems like a perfect fit. On my first turn the mages advanced. One their next move the orcs had advanced close enough to blast them with magic! Conveniently I rolled a four – just what I needed! All three Shugenja threw all their magical energies the enemy generals way. Magician +4 vs everything, Hero +5 versus everything, +1 for being General, -2 for two aiding magicians… even odds – I roll higher than John, the game is over. 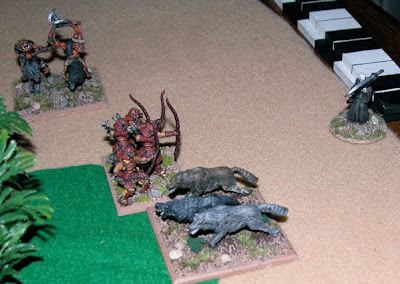 The next bound the orcs made contact! Unfotunately the Orc General then rode down another group of Shugenja! I’m down 8AP to the Orcs 2AP!! 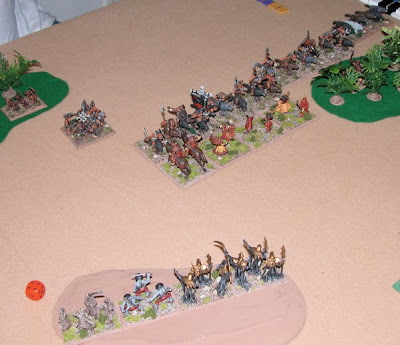 The Phoenix Shugenja work best under pressure, I guess, because the next bound they finally ensorcelled the Orc General… Because I’d lost more the game didn’t’ end right there with the loss of the General. Though I was still down 8AP to the orcs 6AP, it was still the beginning of the end for them. 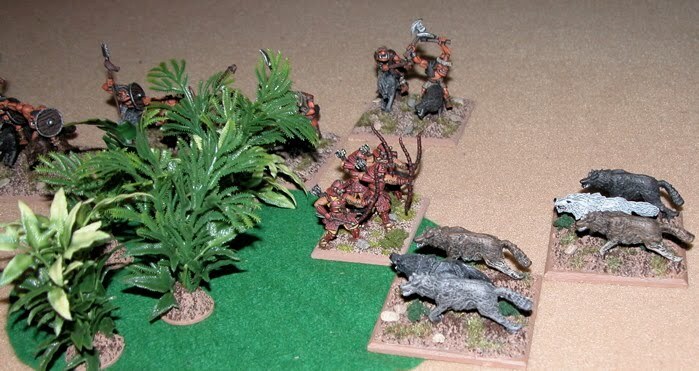 The Wolves charged into the forest and attacked the Samurai Archers! The Archers stood their ground, however, and drove the wolves back!! … and back – right off the table!! John and the defending(!?) Normans. Oh, those aggressive Vikings... What were they thinking. Must have been drunk. Drunk and in charge of a long ship.... Friends don't let friends drink and invade Normandy! The two lines charge towards each other! 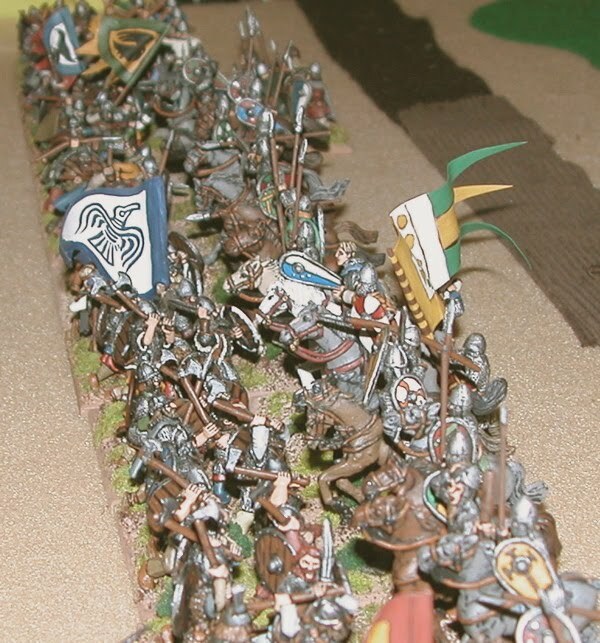 The first clash saw two stands of Viking Blade rode down by Norman knights… but three other Knights were thrown back, and a fourth was locked in combat. Better still another stand of Norman Knights was cut down by a withering storm of arrows from the Viking archers, and a band of Norman Archers were routed by the ferocious Vikings. The next bound the Norman knights wheeled back for another charge! …and that was pretty much it. though antoher band of knights died before the archers, and the Light Horse forced to FLEE, my General and another stand of Blade were ridden down! Final Tally; Vikings lost five Blade (including a General), Normans lost two Knights and two Bow. 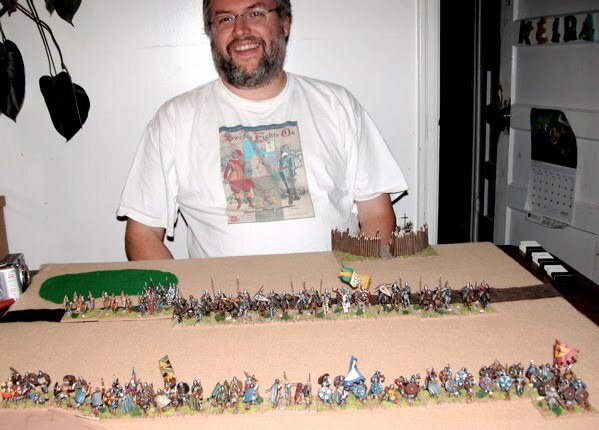 Not sure… could be HOTT/DBA… Could be Contemptible Little Armies… Could be the Savage Worlds East Front Campaign - which I may start reporting on this blog rather than Savage Timmy’s Playhouse (where I have been posting the battle reports…). 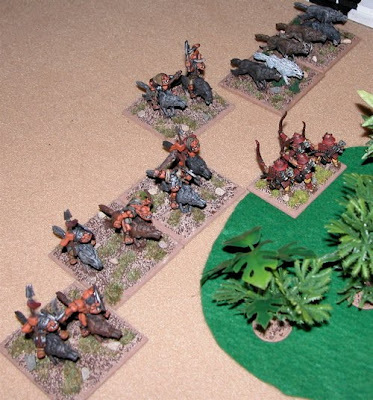 More Phoenix Clan HoTT Stuff, etc. Welcome to the 600th post. Weird, huh? These are Phoenix Clan “Void Guard” for my Hordes of the Things Phoenix Clan army. The figures are old AEG/WOTC Clan War figures. These are “Avalanche Guard” magicians who can turn their skin to stone… or at least cover it with stone… I’m not sure… Anyway, I’ll class them as “Blades” as well. That’s pretty much it for The Phoenix Clan army. 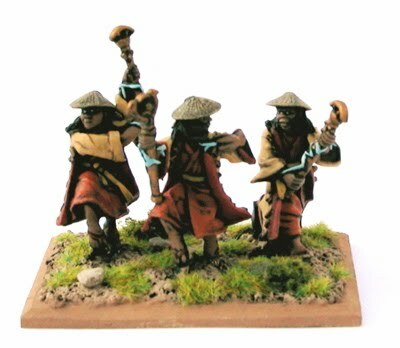 I do have four samurai archers I’m going to paint up as an option. Once I get those done (and figure out how to use this camera a bit better!) I'll post a picture of the whole army together. Shortly after this is posted I should also be posting a report of their first action!! 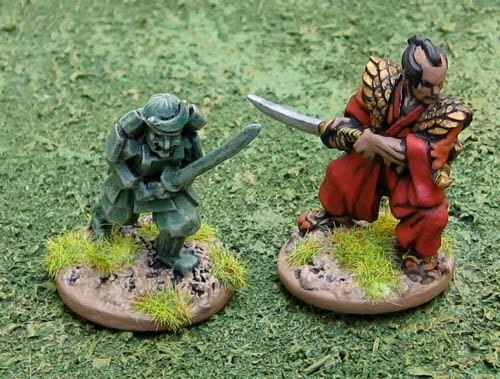 I also painted up one or two of each for skirmishing… There’s also a Phoenix diplomat there that’s from an Old Glory Samurai Villagers pack. 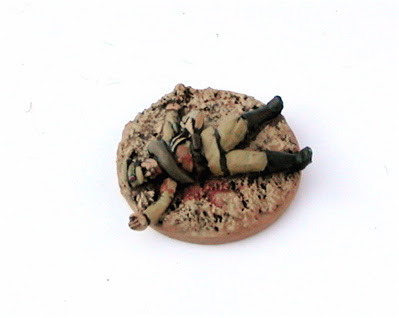 …and a dead Russian from Battle Honors. And finally a giant spider from Games Workshop figures; CONVERTED, painted, photographed and posted here entirely without their permission…. Some more of the Phoenix Clan…? 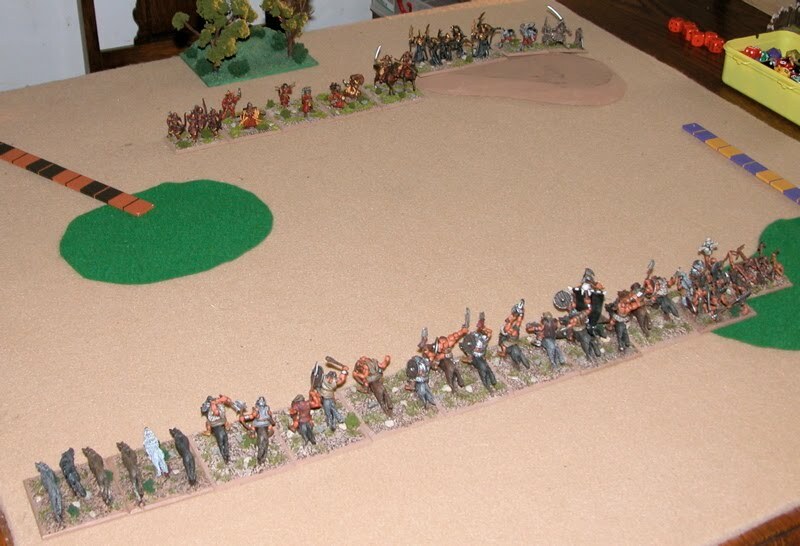 Maybe that stand of archers, just to get them done, and a few more individual figures for skirmishing. I went to take pictures of the Void Guard I finished up yesterday and keep getting this "lens error, restart camera" message - no matter how many times I restart it... I guess I'll have to wait until Amanda gets back so I can use hers. 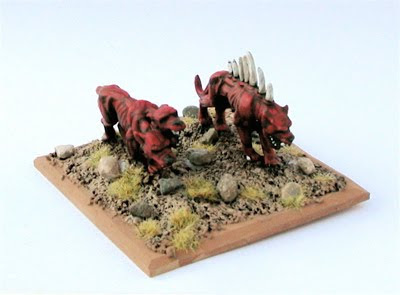 These are two nest stands of Phoenix Clan Shugenja (Magicians) for my Hordes of the Things Phoenix Clan army. The figures are old AEG/WOTC Clan War figures. I have no idea what prompted me to switch gears and paint these up. Maybe a need to do something different…? During all the cleaning and reorganizing I was sifting through the Clan boxes and noticed these and thought I could quickly paint four figures and finish off a THIRD of the entire army! Here’s all three – half the army. 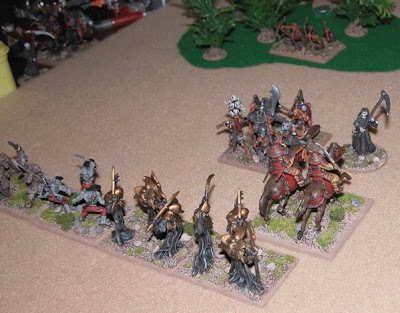 The “Triple Wizard Combo” is hard to play and not a very “effective” army… but “effective” has never been a deciding factor in building an army for me – what SHOULD be there is! As far as I can recall the Phoenix are more or less pacifistic and heavily involved in magic. It seems to me that if brought to battle they would field maximum wizards and try to end the battle before it starts by ensorcelling from afar. The bulk of the melee foot troops will be earth elementals and “Void Guard” – summoned creatures – so they don’t have to actually get their kin into close combat. 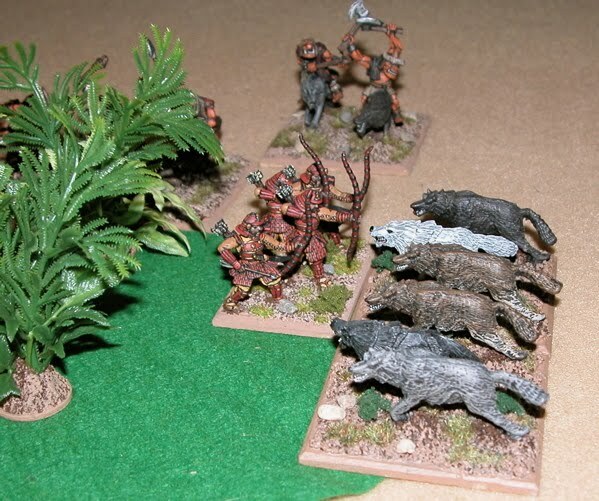 These will be supported by archers and possibly a stand of Shiba Cavalry. I was going to take a pic of what I’ve got so far… but I just need three more stands to finish a full army and two of them I’m just finishing the bases on (the Void Guard), and a couple others (last stand of archera and a couple optional extras) are sitting on my workbench waiting for paint this evening. The forecast for this week is looking HOTT. The Void Guard will be done by tomorrow and a couple other HoTT items have invaded the workbench. Odds and Ends: WW2, etc.